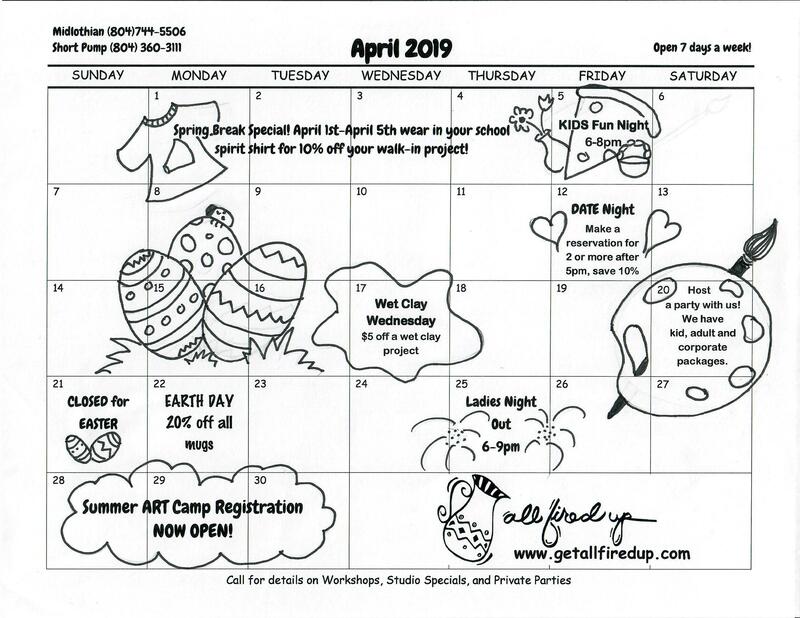 Classes, events, and specials... Find out what's going down at All Fired Up! wearing your school shirt to the studio and receive 10% off a walk-in project! Date Night: Make a reservation for 2 or more after 5pm on Friday, April 12 th and enjoy 10% off your purchase. EARTH Day: Monday, April 22 nd , Create a reusable mug to celebrate Earth Day. All Mugs are 20% off! Easter To-Go Kits: Our Easter To-Go Kits are a perfect addition to baskets! Included in each kit are a bisque bunny, your choice of paint colors, and paint brushes. Bring your bunny back in for firing and a keepsake that long outlasts any of those sugar filled bunnies! Kits are $24.95 plus tax and are in limited quantity! Stop in today to get one! art-camp/ Spots a are filling quickly, don’t wait! Kids Fun Night: April 5 th 6pm-8pm, Spring has Sprung! Drop the kids with us for a night of creative fun! Kids will create a wet clay pinch pot basket, paint a ceramic bud vase and enjoy a pizza dinner. The cost is $25 per child and is for ages 6 and up. Reservations are required so call and sign up today! Ladies Night Out: April 25 th 6pm-9pm, In need of a night out with the girls? Join us as we close the studio for Ladies Night! You’ll receive 10% off your pieces. Reservations are required so call ahead to sign up you and the girls! *Discounts do not apply to private parties or the purchase of a gift certificate. All prices listed prior to tax. For more information please give us a call or visit our website at www.getallfiredup.com.